The Grand Center, St. Louis’ cultural arts center, is hosting its 2012 Annual Spring Art Walk on Friday, May 11, from 5 to 9 pm. 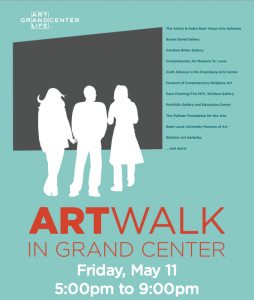 Every year, the Grand Center hosts this celebration of art in its four blocks of galleries, museums, theaters, and restaurants. The Art Walk brings together art lovers all over the city for a joyous spring evening. Visitors can follow the 1.5 mile purple path, guiding them through the arts center from gallery to gallery. Visitors are given “passports” so that they can collect stamps at each destination. Anyone that collects six or more stamps that night will receive discounts at certain restaurants and venues in the Grand Center. Art Walk attendees will have the opportunity to take a closer look at the multitude of exhibitions, with more than a dozen galleries participating in the event that night. Visitors will have the chance to view In the Still Epiphany at the Pulitzer Foundation for the Arts, Warhol’s Polaroids: A Method at the Saint Louis University Museum of Art, and the 2012 Artists-in-Residence at the Craft Alliance, as well as many other exhibits. Many galleries are also holding opening receptions for their new exhibitions on the night of the Art Walk, including The Great Rivers Biennial 2012 at the Contemporary Art Museum, Dark Girls at the Portfolio Gallery, and Hidden in Plain Sight at the Bruno David Gallery. The main attraction of this year’s Art Walk is a giant, colorful string maze called “A Chromatic Confluence.” This temporary public art installation, built by Austin-based art collective Thoughtbarn, will be comprised of over 20,000 feet of colorful string, taking up a 25-by-65 square foot space at Grand Boulevard and Samuel Shepard Drive. The maze consists of multiple openings, allowing visitors to walk through alcoves and varying paths. To add to the ambiance, the installation will be lit at night, and members of the youth orchestra group Orchestrating Diversity will be playing inside of the maze on the night of the Art Walk. 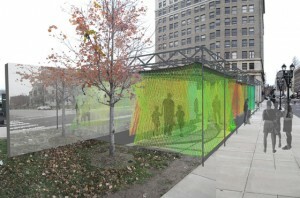 This installation will remain in the Grand Center until June. Art Walk attendees can also enjoy live music from Aaron Kamm and the One Drops, Farshid Etniko, and John Covelli. During the festivities, Grand Center restaurants are open for all to enjoy.